With spring officially sprung, we’re entering that season where the markets, our CSA’s, and our gardens are full of the nourishing foods that get us excited to rediscover healthy. There have been a lot of themes weaving in and out of my life over the past year or so. One of the big ones, certainly the most impactful as of late, has been about getting back into my body. Learning how to listen to what it needs, and learning to love the process of taking care of it. My yoga teacher training program is suddenly winding down, much quicker than I’d like. It’s been one of the most richly invigorating, and revealing experiences that I’ve had in my adult life. Understanding what being an intuitive empath means for my self-care has been an entirely interesting path thus far, a journey I’m most likely just at the beginning of, and one that is so completely intertwined with food and nourishment. After discovering I was gluten-intolerant back in 2016, and more recently having issues with dairy, I wondered where exactly my food preferences were landing in this space. I’ve been repairing my relationship with my body, and food, for a while now. The first few months of 2019 have been the first time in a long time, that my body feels like it’s heading towards a natural rhythm. A rhythm that I understand, and one that I feel confident making choices for. It was what seems like forever ago now, during those weird in between days of Christmas and New Year’s, the ones where you have no concept of what day or time, or year it is, and I could not for the life of me, put down a new cookbook I got- OJAS by chef Nira Kehar. I was interested in Ayurveda before I got the book, but once I dove in I was completely enthralled. It led me to cooking tons of new recipes during the first weeks of 2019. I then looked at our stack of healthy-focused, rarely opened cookbooks and said to myself- wow. We have so many books that we never cook from. I should probably say, books that I never cook from, because I am utterly spoiled by a husband who cooks for us most nights, and not only does he cook, he makes healthy and interesting meals that are somehow never lazily put together, even when it’s a fridge clean-out. It’s truly a blessing, but it also allowed me to be very lazy when it comes to cooking. Which is crazy! I love cooking! How did this happen!? Robert ended up traveling for most of January, which felt like the perfect excuse for me to really dive back into cooking for myself, three squares meals a day, with ingredients that I knew were what my body truly needed. Making a conscious decision to lean on the books for inspiration and planning had reignited that inner fire, that love of cooking and exploring different recipes, of actually making a recipe from a book that sits on the shelf. After diving into Ojas (I’ll be featuring Nira for the Insight Series in the coming months, keep your eyes peeled for that one! ), I decided to revisit my copy of the Archetype Diet. With time to cook for just myself, I finally felt ready to embrace the book’s meal plan. It may sound familiar to you, I included it in my summer reading list here, back when it first came out. I recommended it to so many women in my sphere, and was finding myself increasingly excited by the whole concept. The book revolves around the idea of discovering your particular Archetype, and I cannot recommend enough setting aside a moment to take the quiz yourself. If I had to describe the feeling after reading it in one sentiment, it would be- revealing. I’ll be speaking more specifically about my experience with the Archetype Diet alongside my feature of Dana for the Insight Series, but if you’re on the fence about it, for now I’ll say this. The lasting impact for me is in how much light she sheds on a lot of the self-destructive behaviors we, as women, have with food, that are engrained at an early age and carry on with us through adulthood. Food is so emotional, and learning more about that emotional-gut connection firsthand felt pretty monumental. It’s worth noting that my Vitamix has been getting a crazy amount of action lately, given that smoothies are back to being more of a mainstay of my breakfast routine. 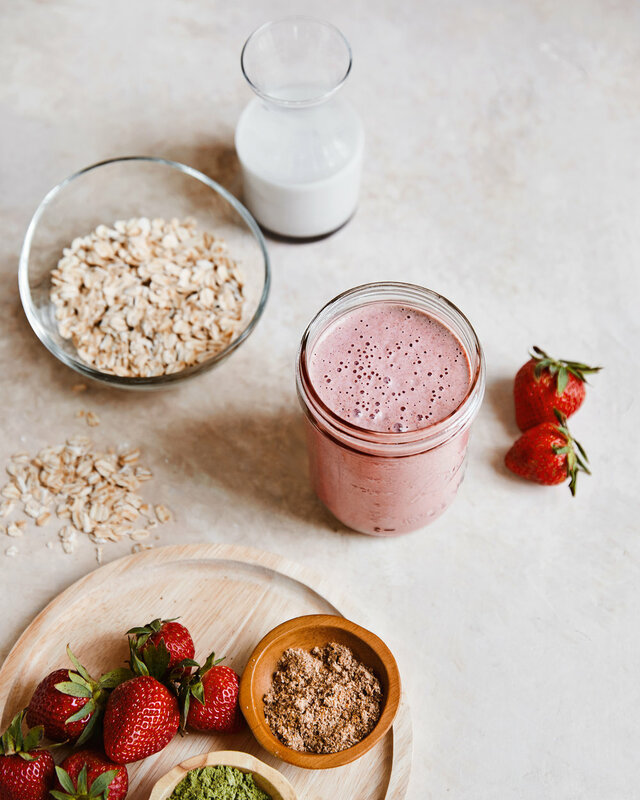 If you’re as in love with them as I am, I’ve included the recipe for my favorite- the Sweet Strawberry Oatmeal Smoothie from Dana’s book below. As the days get warmer, and we feel that sluggish winter energy melt away, it really feels like the perfect time to revisit more of the books that focus on cooking nourishing meals, the ones that help us return to homeostasis. Since I finished the Archetype Diet meal plan, I’ve bookmarked so many recipes from Kimberly Parson’s latest book, the Yoga Kitchen Plan, and have slowly been revisiting the Yoga Kitchen, Life in Balance, and my tried and true copy of It’s All Good. Do you have any cookbooks that help you find your way back to balance, mindful eating, or just ones that you can’t help but revisit again and again? I’d love to hear about them! • Place all of the ingredients in a blender, and blend for 30-60 seconds until smooth.